Last week we were turned away from the German club for the World Cup Final. 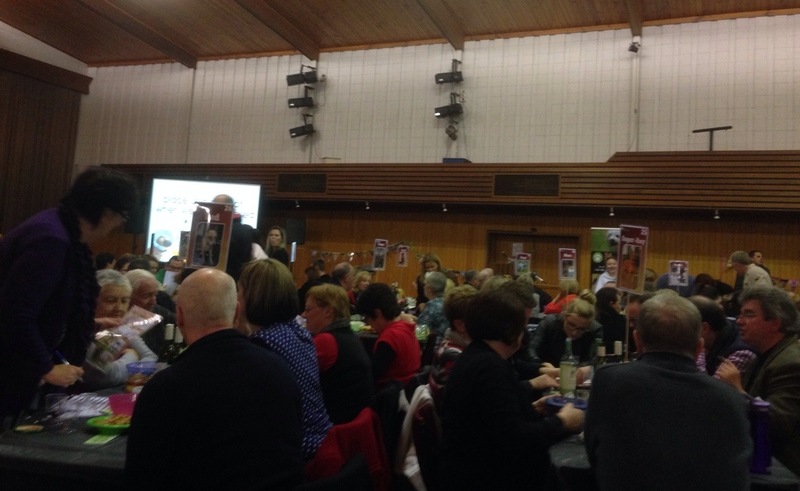 Tonight the Latvian Hall was equally full, but this time we had tickets- to the South Australia Dog Rescue charity quiz night. It was good to see that SADR’s realm in the animal kingdom extended beyond the purely canine- and as far as… cats. Which is taller, the Giant Lobster or the Big Rocking Horse? Who’s won more AFL titles, Collingwood or Geelong? What was the first Australian bank? Was Keith Urban born in Australia or New Zealand? Who won the Brownlow Medal in 2013 (never even heard of it). Fortunately I knew the names of the Green properties on Monopoly (London edition), that St Paul’s burnt down in the Great Fire and the chemical symbol for lead. Otherwise I was totally stumped. I had written off our chances but the team held their nerve… and won, just like the German football team.